We proudly introduce 2 new selections of Hazelnuts. The 2 distinct varieties are car-artic-Gem and car-17 as listed in the Other Edible Nut Trees section. Varieties I now offer are cr-artic-gem, cr-17, plus others. To order the above listed, please use the order form listed below or log onto Other Edible Nut Trees for more detailed information. 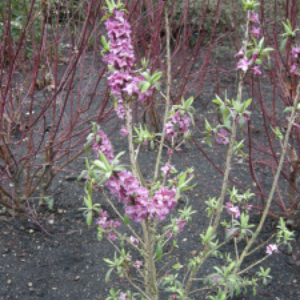 The Russian Almond Is a very hardy, ornamental shrub. Those who want to grow hardy almonds, must have a climatic zone that will not support the common almond. 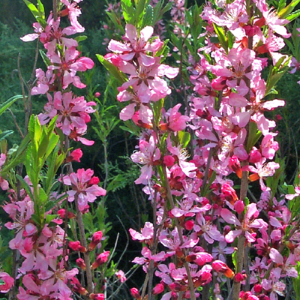 It has a mass number of rose-pink flowers in early spring; very limited supply. Small Chinese native tree having leaves recalling sorbus, and striking one-inch flowers borne in erect clusters. Blooms are cream and yellow and develop a bright red centre as they age. The tree is noted for its landscape capacity. It produces edible nuts which can be eaten raw or roasted. Not only are the nuts beneficial, but the leaves and other parts of trees are used for medicinal purposes. They are being cultivated extensively as an oilseed tree to make biofuel. 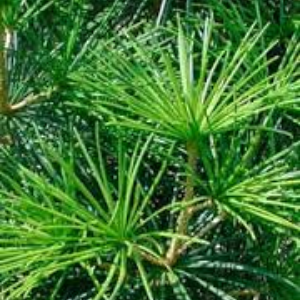 The tree tolerates alkaline soil and is hardy to -35 degrees F. Prefers full sun and dry soil. 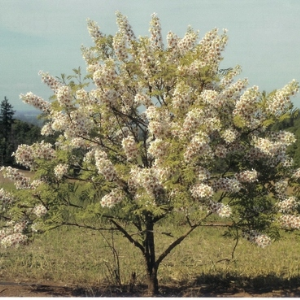 It is an evergreen tree that can grow 30-70 feet tall, with brown main shoots bearing whorls of 4-7 inch long flexible green cladodes that look like, and perform the function of, leaves but are actually composed of stem tissues; occasionally, a cladode will be forked and produce a bud in the 'v' of the fork. The cones are 3 - 7 inches long, mature in about 18 months, and have flattish scales that open to release the seeds. 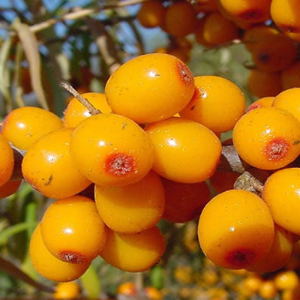 It is a very attractive tree and is popular in gardens, despite its slow growth rate and high cost. Is a very hardy decidious shrub or small tree. The juice from the berries is widely used as a common drink as it is very high in protein, vitamins C and E and organic acids. The leaves either fresh or dried can be stepped to yield a nutritional tea. 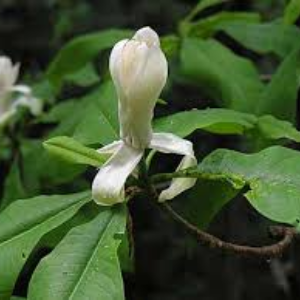 Is used in a wide range of medicinal purposes as well. The roots of the tree produce a nitrogen fixing agent; thus enabling the plants to grow in wide variety types of soils from sandy loam to clay types. They are not self pollinating, so you will need at least 3 or more for production of fruit. Large leaves cluster at branch tips for umbrella effect. White musk scented spring/summer flowers are vase shaped. Ornamental red-pink seed cones with red seeds persist into fall. Does well with filtered sunlight in sheltered location, strong winds tatter leaves. The king of trees! They have proven hardy here for more than 4 years and I now offer them for sale on a first come basis. Limited supply. Is one the most popular Yucca. Very hardy. Creamy-white pendulous flowers 2-3", borne on spikes 1-3' tall in mid July. Daphne mezereum is useful to the landscape architect for its strongly fragrant winter blooms and its architectural habit. Daphne mezereum prefers moist, fertile, well-drained soils. It tolerates most pH of soil. It will not tolerate dry soils. Daphne mezereum requires little pruning. Hard pruning should be avoided, if damaged branches need to removed this should be done immediately after it has finished flowering. Medium to large size of tree. Noted for it's hardiness. Grows in most soils as long as there is good drainage. We have selected several varieties over the past years for their growth habit and good production of medium to large size nuts.